Munich Day 1: Glockenspiel, Deutsches Museum, Englischer Garten and Beirgarten! Hi again. 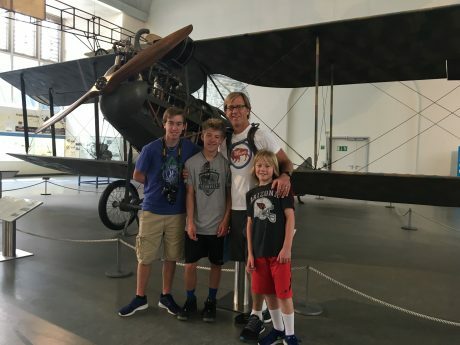 You’ll recall that my husband, Jerry, and I, and our three sons, Wolf, 16, Hayden, 14 and Finis, 9, are on a 29-day “Epic Europe Family Adventure.” Our itinerary includes London, Munich, Germany, Switzerland, Italy and Portugal. 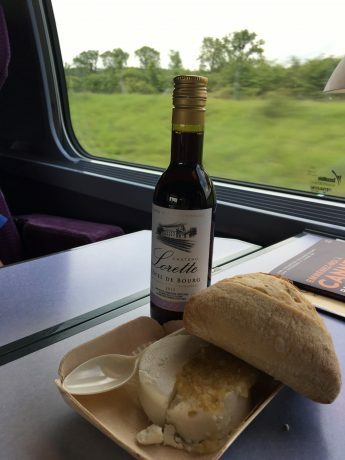 If you’re interested, my two previous trip reports about our time in London are here: From Wyoming to the British Museum and Shakespeare’s The Taming of the Shrew in 24 hours and Big Ben, River Thames, Tower of London and Ice Cream. We have been so excited to explore Munich, Germany. 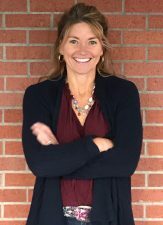 Jerry and I are each half German, so our three sons also are German, and we were all curious about exploring a part of our heritage. And there were numerous other reasons we wanted to explore Munich. The beer, of course. And the yummy food, including the plate-sized pretzels we heard about — the boys couldn’t wait for those! Also, the Bavarian Alps. And the Glockespiel. And so much more. We couldn’t wait to see it with our own eyes, and to really immerse ourselves in the capital of Bavaria. While London represents a first in that it was our first destination where we put our feet on the ground in Europe, Munich marks a bunch of additional firsts, including the long train ride it would take for us to get here, being in a country where English isn’t the primary language, and we’d also try out our first ever AirBnB accommodations. 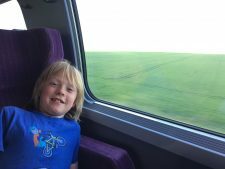 Our youngest son, Fin, enjoying the train ride. We arrived to Munich late, at about 9:30pm, and found our way to the Subway, and then found our way to our accommodations. Hatice, the owner, was wonderful. She had provided a lot of helpful information to me and answered many of my questions leading up to our time in Munich. She greeted us outside of the flat, and we quickly collapsed into a deep slumber. The next morning, we had a free day, which we planned to fill with a 20-minute walk from our flat to Marienplatz, a central square in Munich that has been the central area since 1158.
n the middle of Marientplatz is the Marienpillar, adorned by the gold-plated statue of Mary, which has been at the center of the square since 1638. Marienplatz is named after the Mariensäule, a Marian column (a religious monument depicting the Virgin Mary on the top) in its centre in 1638 to celebrate the end of Swedish occupation. Today the Marienplatz is dominated by the New City Hall (Neues Rathaus). In the Middle Ages, markets and tournaments were held in this city square. 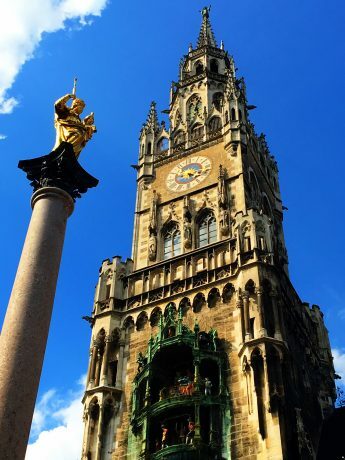 The famous and remarkable Glockenspiel in the tower of the new city hall was inspired by these tournaments, and draws millions of tourists a year. On our first day in Munich, it was the Corpus Christi holiday, which falls on Thursday, 60 days after Easter Sunday. When we arrived to Marienplatz, there was a Catholic church service going on, beautiful music and a procession. It was an expected and pleasant surprise for us to stumble into this. We enjoyed the music and the energy of the Marienplatz, before starting our walk to the Deutsches Museum. The Deustches Museum is the world’s largest museum of science and technology with about 28,000 exhibited objects from 50 fields of science and technology. We spent about 3 hours barely scratching the surface of the magnificent museum. 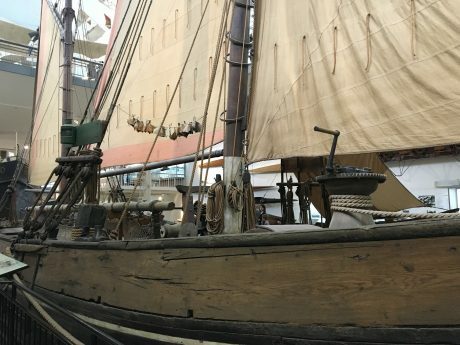 We especially enjoyed the ships and marine exhibits, as well as the computers and musical instruments and air travel exhibits. 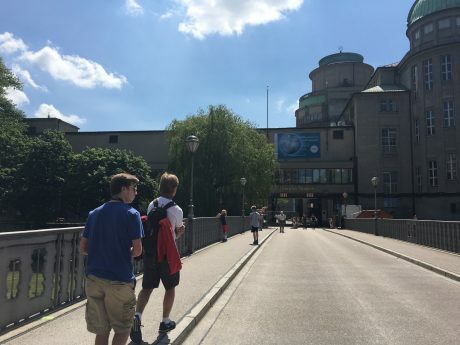 Jerry and the boys, walking to the Deutsches Museum. “The Maria.” A sailing barge used for fishing. One if the last preserved sailing ever of this type. As early as 1882, the sea fisherman A. Bathed and his two sons perished when the Maria sunk in the Elbe estuary. 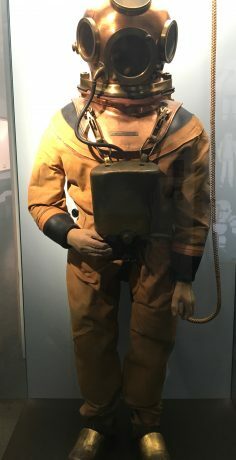 This hose-less diving suit, 1912, consisted of one bottle containing compressed oxygen and a second bottle filled with compressed air. Using a pressure regulating valve, a gas mix was produced which the diver breathed in. Developed to tether diver to the ship. Divers could dive to 40 meters. Turret clock. The public clock that gave the population a standard of time. 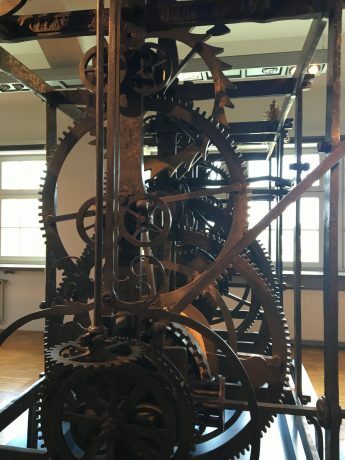 The turret clock was A mechanical clock with weight drives & folkier began spreading throughout Europe in the 14th Century, forerunner of the public mechanical o’clock. The only public clock before this were sundials & large water clocks! Next up: Hofbrauhaus, our first “biergarten” of the trip. Founded in 1589, Hofbrauhaus is the most popular beer garden in the world. 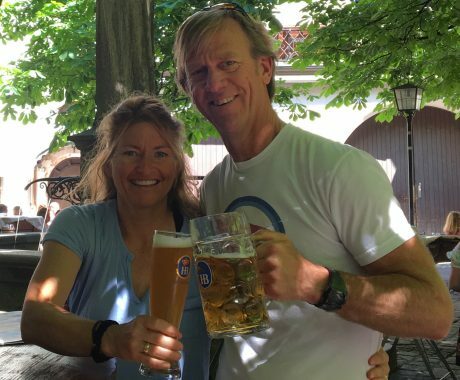 Jerry enjoyed a pint and I had a half pint and the boys had huge pretzels — one of the biggest things they looked forward to indulging in Germany, and there were not disappointed. We also had the yummy and unique Obazda. 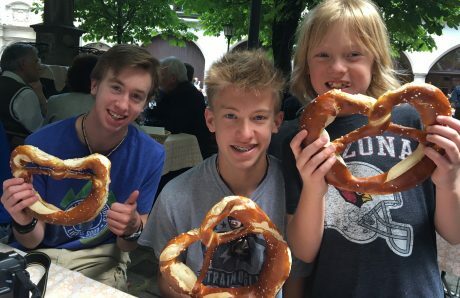 The boys were NOT disappointed in the plate-sized pretzels! After that, we walked to Englischer Garten, a large a large public park in the center of Munich that is one of Europe’s largest urban public parks. There’s a wonderful path that follows alongside the Isar River. On the day we enjoyed the park, we watched as surfers took their turns surfing at one of the artificial streams flowing through the Englischer Garten. Essentially it’s a standing wave produced by a water pumping mechanism. Surfers line up along the bank taking turns entering the water with their boards. After a minute or so, successful surfers will voluntarily drop out returning to the end of the line allowing the next person in line an opportunity. 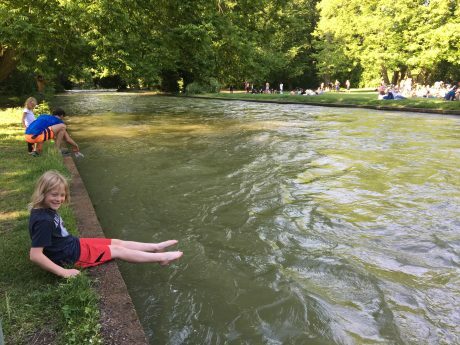 Fin dips in his toes in the water in Englischer Garten. The Glockenspiel happens every day at 11 a.m. (as well as 12 p.m. and 5 p.m. in summer). See my short video capture below. This is then followed by the bottom half and second story: Schäfflertanz (the coopers’ dance). Wikipedia says this: According to myth, 1517 was a year of plague in Munich. The coopers are said to have danced through the streets to “bring fresh vitality to fearful dispositions.” The coopers remained loyal to the duke, and their dance came to symbolize perseverance and loyalty to authority through difficult times. By tradition, the dance is performed in Munich every seven years. This was described in 1700 as “an age-old custom”, but the current dance was defined only in 1871. The dance can be seen during Fasting (German Carnival): the next one is in 2019. 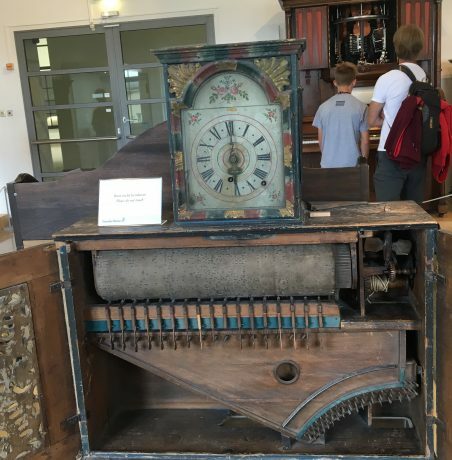 The whole things lasts about 15 minutes, and its ending occurs after a small golden rooster at the top of the Glockenspiel chirps quietly three times. We loved watching the Glockenspiel, and it made our first day in Munich feel complete! By the way, my FitBit indicates we walked 29,000 steps today. It was only our first day in Munich, but I’d say we covered a lot of ground, and couldn’t wait for more exploring tomorrow. Next up: Bike riding in the Bavarian Alps, and exploring Neuschwanstein Castle! Thanks for reading, and please stay tuned for more posts here as we make continue exploring Munich, Germany, and then head to Lauterbrunnen and Zermatt, Switzerland, Italy’s Cinque Terre National Park, Pisa, Florence and Rome, and Lisbon and Lagos, Portugal.